To avoid many of the legal hassles of importing hi-cap rifles into the country Century Arms had single stack Romanian AKs imported and then converted them to hi-cap once in country. Unfortunately to save money, their quality control department must have been on "break" because a good majority of the WASR-10 that were converted were not completed all the way. 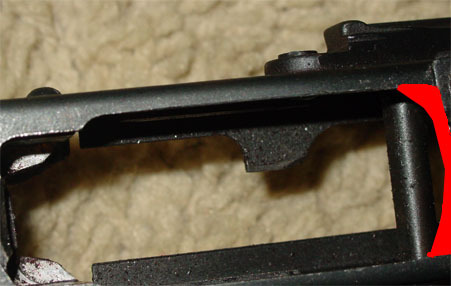 The problem is most of the rifles still have 2 little burs at the back of the magazine well that interfere with inserting magazines, and drums into the rifle. What this tutorial will show you how to do is correct the problem so both magazines and drums fit into your rifle with no hassle. Hopefully this tutorial will put a end to all the nay Sayers that a WASR-10 can not accept drums. Basically the only tool you will need for this fix is a trusty old dremel. Notice the two burs in figure a below. These are what are causing the majority of the problem. 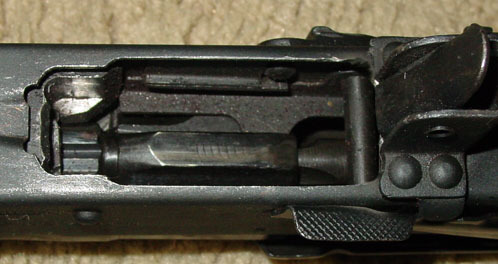 These burs combined with a far to rounded magazine well towards the rear is the reason most magazines have trouble fitting. 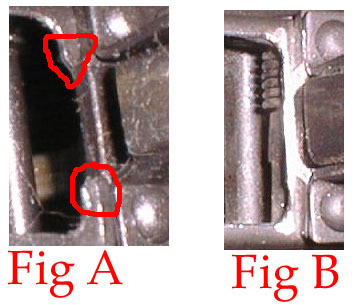 The first thing you need to do after you fieldstrip the rifle is to take the dremel and remove the two burs so you get a flat edge under the magazine catch so it looks like figure b above. Next you need to clean up the rounded profile of the magazine well as highlighted in red in the above picture. Its best to take off a little at a time and test fit your drum/magazine. Once it fits fine take a file and smooth out the rough edges. Once finished the well should look similar to above photo(note in this picture I did not smooth out the rough edges with a file yet which is the last step. Make sure you file down the rough edges and clean out all the metal shavings before shooting. Now that you have fixed Century's "mistake" your WASR-10 should accept all magazines and drums. Above is a photo of my WASR-10 with a chinese drum.